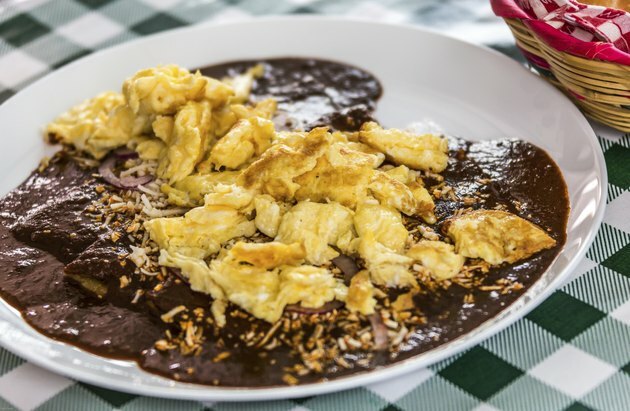 Mole is a traditional Mexican sauce composed of onion, garlic, chili peppers, Mexican chocolate, spices and ground nuts and seeds -- and it's usually served with poultry. Mole is highly caloric and contains a significant amount of fat, according to Epicurious. Topping your chicken with a 1/4 cup of mole made from a dry mix packet adds 378 calories, 27.63 g of carbohydrate, 27.55 g of fat, 6.7 g of fiber, 4.96 g of protein and 771 mg of sodium, according to the U.S. Department of Agriculture's National Nutrient Database. Mole's calorie composition is approximately 66 percent fat, 29 percent carbohydrate and 5 percent protein. A 1/4 cup serving of mole offers 29.3 percent of the vitamin B-6, 29.2 percent of the riboflavin, 24 percent of the phosphorus, 21 percent of the iron, 20 percent of the magnesium, 15.4 percent of the calcium, 15.1 percent of the zinc, 12.3 percent of the iron and 10.5 percent of the niacin adults should consumer per day, according to the Institute of Medicine. A 1/4 cup of mole contains 35 percent of the fat and 34 percent of the sodium a healthy adult should limit themselves to per day, according to the Mayo Clinic.com.